Headquartered in Washington D.C., Paxton operates domestic locations in Springfield, Manassas, and Alexandria, VA, and international offices in Baghdad and Erbil in Iraq; Kabul, Herat, and Mazar I Sharif in Afghanistan; Peshawar, Pakistan, Juba, South Sudan, and Singapore. Paxton goes where our clients need us most so we have Boots on the GroundTM in the most difficult regions of the globe. Paxton Record Retention Primary Records Facility servicing the Washington, D.C. Metropolitan region. A long-term storage facility that is a climate and humidity controlled state-of-the-art building outfitted with the Euro Air Sox Ventilation System - the only one of its kind on the entire east coast. We’re very proud to announce the opening of our new, spacious, Office Moving Division warehouse in Alexandria, VA.
We keep our clients informed of the ever-changing situation on the ground with our own full-service office in Baghdad. This location offers scheduled and air charter services directly to Iraq, Security escorted trucking from the border to destination and warehousing and distribution in Iraq. Paxton BIAP established in 2014 to support our clients in Baghdad. Paxton International is happy to announce the opening of our office in Erbil. Paxton International is your full service door-to-door transportation provider for project cargoes and personal effects shipping to and from Afghanistan. Paxton International has Boots on the GroundTM in Peshawar, Pakistan. Paxton is proud to announce the opening of our Juba, South Sudan office. Paxton International has expanded to Singapore. 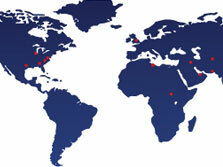 Paxton has a number of offices around the world to assist with global and local customer service.